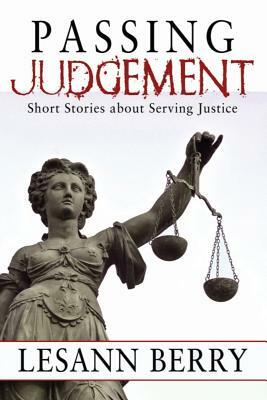 Passing Judgment is a compact collection of twelve short stories about people who deliver their own form of justice. These are tales about breaking the rules and seeking retribution, especially when the law fails. Bad guys sometimes do the right thing. Desperate good guys cross the line. In the end, justice is blind-she doesn't care which side of the law a person lands as long as the scales get balanced. Inside you'll find stories about: - A Senator collects historic guns, each responsible for shooting a sitting President. - Guilt drives a desperate man to seek redemption through acts of violence. - In search of his true identity, a man makes a fatal lapse in judgement. - African mythology intersects with an escaped slave imprisoned in a strange world. - Social scandal, great wealth, and a bizarre bequest point to old murder. - After an error releases a predator, a detective crosses the line to stop the killing. - A lottery ticket bought on her birthday propels Ivanka's future sideways. - The assassin sent to eradicate a target, discovers he doesn't want to pull the trigger. - An orphan journeys home to seek retribution for a mother gone missing. - Law enforcement holds itself responsible for the murderous actions of a young man. - Bethany's dull marriage takes on new worth when a gunman steps off the elevator. - Old acts of violence bring together two men in a reciprocal act of retribution. Excerpts: "Mitch shook out his hands, watched mud and slime splatter against the hard packed dirt. After damn near six hours of slogging through bottomland, he'd found a road. He hiked up one canvas pant leg and inspected the three tiny pairs of puncture wounds on his calf. Almost delicate, the trio of red perforations marked the places where a determined cottonmouth had struck repeatedly. Each bite-mark was an objection to the disturbance Mitch caused as he struggled to hold the woman's head under the surface of the brackish water. At seventy-three, the lady had been a real scrapper, a good fighter." - Last Chance for Redemption "The gun swept the room, the assailant's arm held straight out like an accusing finger until it pointed at her chest. Death would be swift at least. She supposed the end of life offered a resolution of sorts. The upside meant no more strain or deception. Bethany squeezed her eyelids shut and found comfort in knowing that Brian would mourn her passing. Her dumpy husband had wormed his way into her slate heart. That was something." - The Man in the Dark Suit "A car would be waiting at the street level in a matter of minutes; she just had to reach that relative safety. She tightened the straps on her backpack and thought for a fraction of a second about the man who'd fathered her. He'd been an absentee parent for the last few years but it hadn't always been that way. To her surprise, a tear spilled down her cheek. She was an orphan now. Well, as much as any daughter of the Russian District was allowed to be, since the community was family too." -The Tsar's Granddaughter. As an anthropologist, Lesann Berry divides her time between academic interests and professional research, focused primarily on the American west. Inspired by the geologic features of empty landscapes, the ancient art and prehistory of those settings often feature in her work. She writes about messed-up people involved in sinister events and says her stories often feature paranormal or romantic elements because life is boring without spooky stuff and warm bodies. Crossing genre lines, she pens both contemporary and historical mysteries, romantic suspense, and even a little horror. Visit www.lesannberry.com for information about upcoming releases.